The sheer athleticism, indominatable spirit, powerful elegance, and flawless teamwork of a horse and rider: is anything more beautiful? Finding jewelry that commemorates your love of hunting and jumping can be difficult. How can mere gold — or in this case, sterling silver — truly express the passion, the beauty, the elegance and power of the the bond between horse and rider? One must choose carefully! In this case, good things come in small packages: in a pendant just over a half-inch square, we see the alert ears, eagerly pointed toward the next obstacle. Intricate detail work reveals the braided mane, ready for the arena. The bridle and reins are exquisitely worked, demonstrating the mechanism by which the pinnacle of equestrian perfection can be reached. 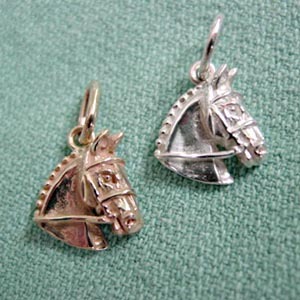 This stunning small pendant can also work on a charm bracelet. It is available in 14K gold as well as sterling silver, offering you a range of options. If you are on a team or ride with several other riders from the same stable, you can show your solidarity by all wearing the same charm! With elegant styling, exquisite craftsmanship, and a place for your favorite photograph of your horse (or sweetheart!) </a> this locket is the perfect accent to any outfit: as appropriate in the office as the showring, suitable for any occassion. 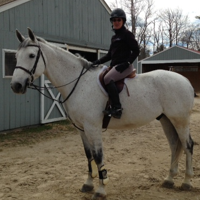 A sure favorite for the hunter/jumper fans! 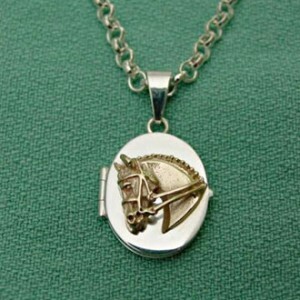 The combination of silver and gold in one classic piece is very hot right now, speaking to the fashion forward equestrian!